Housed in the Masonic Hall on Coleman Street, near the Central Fire Station, Bacchanalia binds perfectly both classic and modern flairs not only through its slick interior design but also through its carefully crafted dishes. 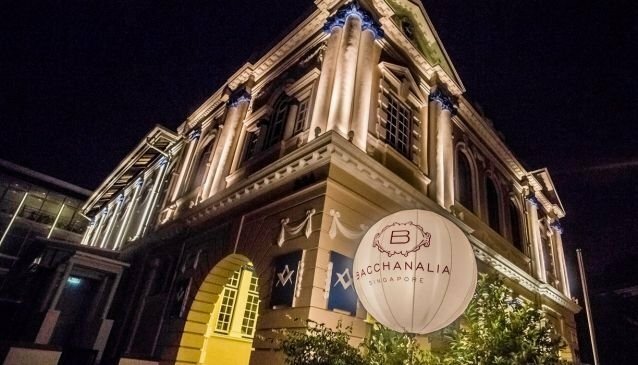 Bacchanalia serves reinvented classics and daring dishes that are influenced by flavours, techniques and quality ingredients from around the world. With its well-executed small plates of refined cuisine, Bacchanalia's menu is fashioned to encourage food sharing among friends, adding to the overall feeling of comfort and relaxation of the stylish place. This award-winning restaurant also features a popular bar and lounge with DJ, where guests can come for a tipple and relax until late. The 3-course Set Lunch Menu is at S$48++ and the White Truffle Set lunch at S$120++. And between S$38++ and S$156++, you can enjoy one of the hypest weekend brunches found in town.